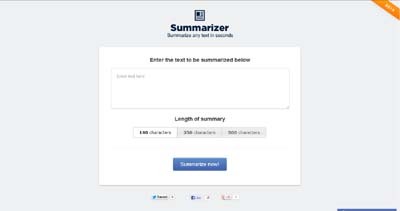 Summarizer is a free time-saving cloud based solution that uses sophisticated syntactic analysis technologies to form accurate summaries instantly. It allows you to summarise long articles in reports in seconds, saving you precious hours of time. Whilst there are a number of text analysis players out there trying to achieve the same thing, most of them combine low-end linguistic technologies. Summarizer’s pedigree is different.